Researchers at the University of Michigan received $1.6 million from the Department of Energy’s Solar Energy Technologies Office to develop windows that contain solar cells and research heat retention from solar thermal energy, the school announced Thursday. The solar cell window research is supported by $1.3 million. Many building windows have a coating to reduce glare and unwanted heating, discarding 50-70 percent of available energy. The researchers are developing flexible, clear solar cell sheets that would capture the energy instead. Conventional solar cells use hard, opaque silicon. Forrest’s group makes solar cells with organic, or carbon-based, materials that can be transparent and flexible. They have developed thin photovoltaic sheets that can capture 8 percent of the sunlight without dimming the view more than coatings already do. The new project will double that to about 15-percent efficiency and 50-percent transparency, similar to some tinted windows. The product’s big advantage is its ability to be made in rolls, creating fast production, high volume, and low cost. Forrest is one of the founders of Universal Display Corp., which creates organic light-emitting diodes. The other new solar project is funded with $325,000 and aims to reduce the heat lost when capturing solar thermal energy. Solar cells turn light directly into electricity, but electricity is difficult to store. Energy captured as heat can be held until it is needed and then converted to electricity. In a solar thermal setup, sunlight shines onto an absorber, typically a pipe with a fluid inside. The heat carried by the fluid is used to turn a turbine in a power plant. “Operating at high temperatures is needed for efficient electricity generation, but it is quite challenging from a materials perspective,” says Andrej Lenert, assistant professor of chemical engineering and leader of the high temperature solar energy project. At the necessary temperature – 1,300 degrees Fahrenheit – conventional solar collectors lose 15 kilowatts per meter squared, or enough to run a 100-watt light bulb from an area the size of two credit cards. Lenert’s team wants to cut this loss by about 67 percent. Their silica aerogel insulator is made mostly of air pockets held together with a fine network of glass. A 1-inch thickness of their aerogel provides insulation similar to standard 3.5-inch fiberglass wall insulation. The transparent aerogel does not naturally block the infrared rays that account for most of the heat lost at high temperatures. 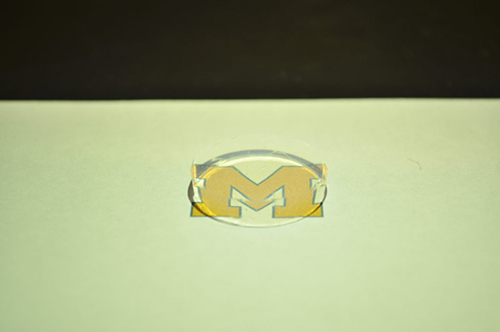 Lenert’s team worked with Neil Dasgupta, assistant professor of mechanical engineering, to add an ultrathin layer that interacts with infrared light. The coating creates a maze that infrared rays cannot escape, forcing them to be constantly absorbed and emitted by different surfaces while not having the ability to reach the outside. It doesn’t interact with the visible light, allowing it to cut straight through and heat the absorber. The goal is to achieve such high temperatures that a special form of carbon dioxide can be used as the heated fluid, enabling more efficient conversion to electricity than is possible with the standard steam turbine.